Today, Transcendentalism can be seen through art and film. Check out these examples! Architecture is a form of art, and in 1936 this piece of art was deigned by Frank Lloyd Wright. Fallingwater is the name of the house that was build over a 30 foot water fall in Pennsylvania. This piece of architecture is built right in the middle of the woods which means who ever lived there would be close to nature. This house represents the idea of the over-soul, which is a key idea of transcendentalism. The house appears to be intertwined with the trees and the water fall, and this represents a connection with nature. When you are close to nature you are also close to God. The house shows that humans, nature and God are all connected. Click here to learn more about Fallingwater! 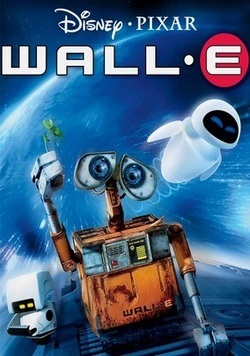 Wall-E is a movie about a robot who gets left behind on earth when all the humans leave because the earth is too polluted. This movie reflects transcendentalism because it shows the importance of nature. In the movie there is nothing natural left in the world because the humans made the world completely mechanized. During the industrial revolution, this is exactly what the original transcendentalists did not want to happen. The humans in the movie live a life where everything is done for them with the push of a button. We see the consequences of this lifestyle because they have all become obese, and eventually they cannot live like that any more. Wall-E foreshadows what could happen to the world if we don't take care of our environment. It also reminds us of the importance of nature, and to live simpler lives. Watch the Wall-E trailer below!